Federal Realty Investment Trust (NYSE: FRT) today announced plans for a renovation of The Crest at Congressional Plaza, a 146-unit apartment community in Rockville, Maryland. The renovation plans designed by award-winning architect Mark McInturff and local interior designer Mary Lohre include a new outdoor cafe area, new swimming pool and lounge area, updated patios for select apartments, refreshed amenity spaces, and upgrades to apartment interiors to create a Zen-inspired residential community. Interior improvements include new porcelain flooring, modern luxury kitchens, hotel-inspired bathrooms and a designer lighting package. Originally built in 2002 by Federal Realty Investment Trust, The Crest at Congressional Plaza is managed by ROSS Management Services and is ranked by Apartment Ratings as a 2012 Top Rated community. For more information, please visit www.crestatcongressional.com. About Federal Realty Investment Trust: Federal Realty Investment Trust is an equity real estate investment trust specializing in the ownership, management, development, and redevelopment of high quality retail assets. Federal Realty’s portfolio (excluding joint venture properties) contains approximately 20 million square feet located primarily in strategically selected metropolitan markets in the Northeast, Mid-Atlantic, and California. In addition, the Trust has an ownership interest in approximately 1.0 million square feet of retail space through a joint venture in which the Trust has a 30% interest. Our operating portfolio (excluding joint venture properties) was 95.1% leased to national, regional, and local retailers as of March 31, 2013, with no single tenant accounting for more than approximately 3.2% of annualized base rent. Federal Realty has paid quarterly dividends to its shareholders continuously since its founding in 1962, and has increased its dividend rate for 45 consecutive years, the longest record in the REIT industry. Federal Realty is an S&P MidCap 400 company and its shares are traded on the NYSE under the symbol FRT. About ROSS Management Services: ROSS Management Services, an affiliate of ROSS Companies, manages 34 apartment communities in and around the Washington, DC metro area. ROSS Companies, founded in 1983 in Bethesda, MD is a recognized leader in apartment acquisitions and investment, development, property management and renovation. 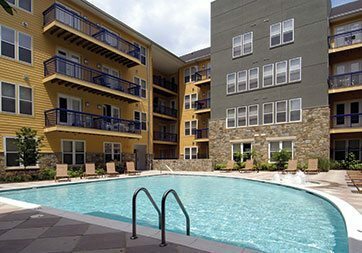 With more than 11,000 apartment homes in its portfolio, the company is one of the most active multifamily real estate firms in the Mid-Atlantic region. ROSS Companies is comprised of three affiliates – ROSS Development & Investment, ROSS Management Services and ROSS Renovation & Construction. ROSS Development & Investment is celebrating its 30th anniversary this year and ROSS Management Services is celebrating 25 years in business. About McInturff Architect: McInturff Architects, founded in 1986, has a diversified client base which includes residential, commercial and small institutional projects, with a focus on highly crafted projects. The work of the firm has been frequently published locally, nationally, and internationally. The firm has received more than 275 design awards, including a 2003 AIA Institute Honor Award for Interior Architecture, a 2005 AIA Institute Honor Award for Regional and Urban Design for the firm’s part in the design of Cady’s Alley in Georgetown, and, in 2006, a second Institute Honor Award for Interior Architecture for the Woolly Mammoth Theatre. The firm is the subject of two monographs published by The Images Publishing Group of Australia, In Detail: McInturff Architects (2001), and In Residence: McInturff Architects (2007). A third monograph, In House: McInturff Architects, is scheduled for release in spring 2013.